Microsoft Azure enables developers to effectively secure their application with minimal coding. You will learn how to protect application configuration settings, encrypt data in transit and at rest, and use Azure disk encryption for IaaS scenarios. At the core of developing applications for Microsoft Azure is a thorough knowledge of securing data. 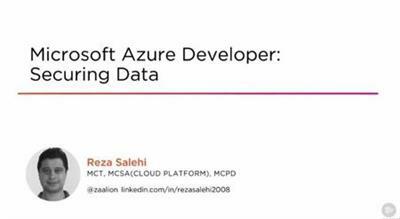 In this course, Microsoft Azure Developer: Securing Data, you'll learn how to protect your application configuration and data from unauthorized access. First, you'll learn how to secure your application configuration settings such as database connection strings using Azure Key Vault and Managed Service Identity (MSI). Next, you'll explore Azure Storage Service encryption for data at rest (SSE), Azure Disk Encryption (ADE) and Azure SQL Database Always Encrypted, to protect data against disk theft, or to comply with security standards. Finally, you'll discover how to secure client-server communications using SSL/TLS encryption. When you're finished with this course, you'll have the necessary knowledge of securing data to help you in leveraging Microsoft Azure's out-of-the-box offerings to develop more secure applications.